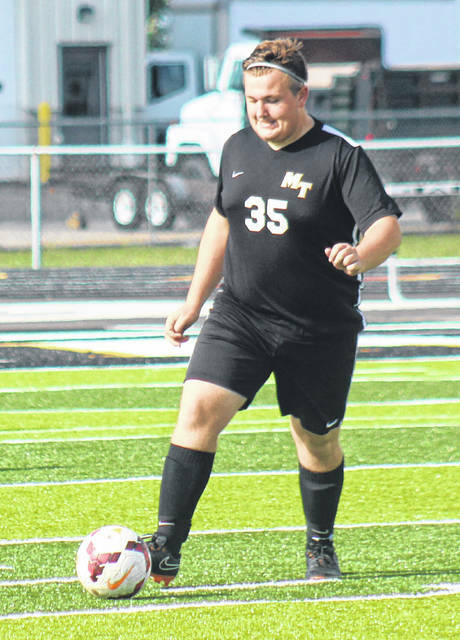 Coby Seyfang at his recent game against Circleville for the Miami Trace soccer team. At Monday’s school board meeting, Miami Trace High School Principal Rob Enochs — as well as other district administrators — spoke about Coby Seyfang, a MTHS senior who was involved in a serious car accident. Enochs — who was attending the Monday board meeting with other members of the Miami Trace administration team — gave a brief update on Coby. He said members of the high school have been to see Coby throughout the weekend at the hospital since the accident and have continued to show his family support during this difficult time. According to reports, a 2007 Honda Civic, driven by Jacob (aka Coby) E. Seyfang, of Leesburg, was heading south on Washington-New Martinsburg Road at around 8:15 p.m. last Thursday when he went off the left side of the roadway before crashing into a tree, said Fayette County Sheriff Vernon Stanforth. Seyfang was trapped inside his vehicle before being extricated by members of the Concord-Green Township Fire Department, Stanforth said. He was treated at the scene by members of Fayette County EMS and subsequently airlifted from the scene by MedFlight to Grant Medical Center in Columbus for further treatment. Since the accident, the outpouring of support on both social media and at the high school have been incredible. Using “#COBYSTRONG,” community members have shared updates on his health online, and have expressed their support and prayers for Coby and his family. Stay with the Record-Herald for more updates on the Miami Trace Local Schools Board of Education. https://www.recordherald.com/wp-content/uploads/sites/27/2018/08/web1_Coby-Syefang-vs-Circleville-8-21-2018.jpgCoby Seyfang at his recent game against Circleville for the Miami Trace soccer team.